You have added Detailed Design Flutter Sleeve Sheath Dress into shopping cart. This graphic patterned dress has a flattering cut that makes it perfect to wear to work in a business casual environment or out for drinks with friends. The Detailed Design Flutter Sleeve Sheath Dress is made of a soft comfy fabric with black and off white designs throughout. 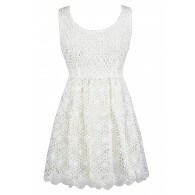 It has a subtle V neckline, an empire waist, and a classic sheath cut. A pocket on each side of the skirt adds a laid-back feel to this dress. Ruffle flutter sleeves add a chic and girly touch. A hidden back zipper completes this dress. 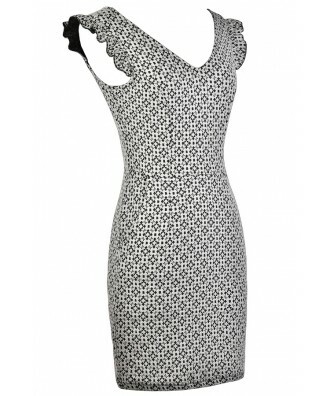 The Detailed Design Flutter Sleeve Sheath Dress is the perfect option to pair with black pumps or heels. Details: Unlined. 100% polyester. Hand wash cold. Do not bleach. Hang or flat dry. Low iron. Small measurements: Length from top of shoulder to hemline: 34". Bust: 34". You have added Detailed Design Flutter Sleeve Sheath Dress into Wishlist. 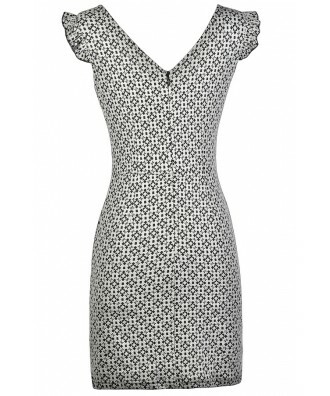 You have added Detailed Design Flutter Sleeve Sheath Dress for Stock Notification. You have set Detailed Design Flutter Sleeve Sheath Dress as a loved product. You have removed Detailed Design Flutter Sleeve Sheath Dress as a loved product.